THE new 200 mm LED displays from Amalgamated Instrument Co (AIC) are suitable for wide coverage applications. The displays are manufactured using ultrabright red LEDs and are equipped with a configurable "auto-brightness" feature. This feature varies the brightness of the display in response to ambient light. The display will be bright in high ambient light but will dim as the ambient level drops. The level to which the display dims can be easily configured at the display. The "auto-brightness" feature minimises display "dazzle" under low light conditions. 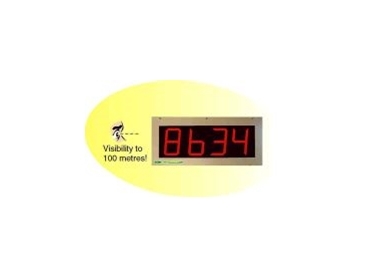 The display can be installed on most of Amalgamated Instrument's large digit models. Inputs range from analogue dc (4-20mA), to load cells, to pulse input for rate/total/counting plus many others. The AIC model LD-RTC real time clock fitted with the 200mm display can be programmed with up to 32 alarms for different day times and durations. A minor modification to the main board will also enable the display to toggle between clock and temperature displays (a suitable temperature sensor and shielding would be needed). An LD-TMR multifunction timer with the 200mm display would be ideal in a factory situation as an "accident free day" timer and display, or in a sports application for timing with warning alarms, etc. The LD-WT is a high precision, high accuracy monitor for strain bridge applications (load cells, level transducers, pressure sensors etc). With a 200mm display and with suitably configured alarm relays (four setpoint relays are standard with the LD-WT model), the instrument would be ideal as a display and warning system for a load lifting system, or for use on a weighbridge. Other applications can also be catered for with the new 200mm display. These include serial input, BCD/binary input, SSI input and temperature input. The display can also be configured as a slave for "back to back" display applications. The 200mm LED display enhances the wide range of displays available for the AIC range of large digit display products with sizes ranging now from 38mm to 200mm.